DIRECT MAIL IS A GREAT WAY TO ADVERTISE. You are sending very specific and targeted messages to your mailing list. Delivering the right message in the right market, this approach is likely to provide a high return on investment. Direct Mail Marketing campaigns is getting your hands on a good list! • Make it short and sweet! P.S. Use the postscript to grab their attention one last time! Identifying your business’ target market is critical. Know who your clients are and understand what market they are in. Figure out not only what market your current clients are in, but also determine which market you want your future clients to come from. Lawn Care is a relationship business and it is very common that a homeowner that has lived in a house for 10 years already has developed a relationship with a friend of the family, or a friend of a friend, or just another business. 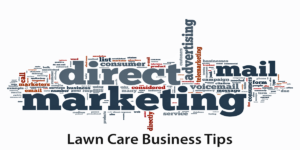 So, it can be very hard to break into markets were other lawn care companies are already working and forging their own customer relationships. Sometimes you have to overcome a perception of value and an expectation around price. Make sure you know who your clients are. Also know what type of service you are offering and how they fit together. You need to understand what kind of customer you are looking for and split the customer base into categories. Break it down any way you want… but think about who your customer is… then think about who you want your customer to be… and then mail something to that customer!